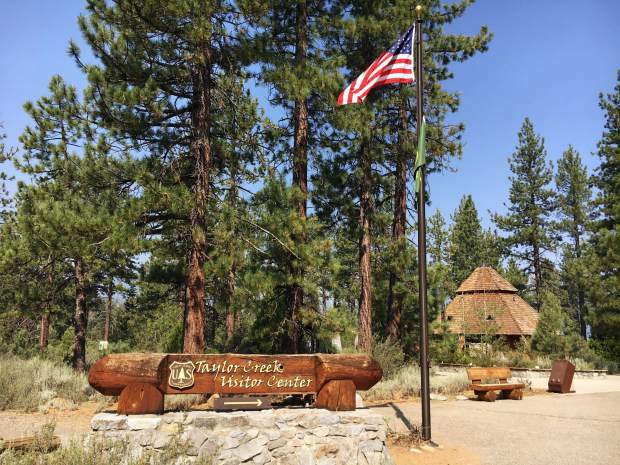 The Taylor Creek Visitor Center is open through Oct. 28. Another sure sign of winter’s pending arrival came last week, when the U.S. Forest Service Lake Tahoe Basin Management Unit announced it is beginning to close recreational facilities for the season. The closures apply to many beaches, campgrounds, picnic areas and forest roads in the Tahoe Basin. Campgrounds, day-use areas and beaches on National Forest lands managed by Tahoe Recreation, a division of California Land Management, closed on Oct. 14. These include: the campgrounds at Bayview, Fallen Leaf, Kaspian, Meeks Bay, Nevada Beach and William Kent, and the day-use areas and beaches at Baldwin, Kaspian, Meeks Bay, Nevada Beach, Pope and William Kent. Blackwood Canyon, Luther Pass and Watson Lake campgrounds close on Nov. 15. Zephyr Cove Resort Campground remains open year-round. For a complete list of site closure dates, visit http://www.fs.usda.gov. The Taylor Creek Visitor Center and Kiva Picnic Area are open daily through Oct. 28. The Tallac Historic Site closed for the season at the end of September. The Forest Service warns that bears are very active in the Taylor Creek area this time of year. “Keep your distance from bears, leave food and other scented items at home, stay on the trails and help protect bear habitat and salmon eggs by not entering Taylor Creek,” the Forest Service says. Forest roads typically begin closing in mid-November. Visit http://www.fs.usda.gov for specific forest road closing dates. Although facilities on National Forest lands at Lake Tahoe close for winter, the grounds and lake access remain open year-round. Services such as water, restrooms and trash collection are not available during the winter season. “When accessing these areas in the winter, be sure to pack out your garbage, park legally and do not block closed gates,” the Forest Service says.